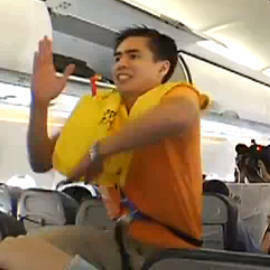 VIDEO: Cebu Pacific's male flight attendants literally do the "Safety Dance"
VIDEO: Cebu Pacific’s male flight attendants literally do the "Safety Dance"
Learn about oxygen masks and lifejackets to the tune of the ’80s hit. Hot on the heels of the viral video of Cebu Pacific’s dancing female flight attendants comes another video of a similar in-flight demonstration in dance form, this time featuring male attendants, reports the AFP via Inquirer.net. During a morning flight from Manila to Davao City on October 8, as the plane reached cruising altitude, three male flight attendants showed passengers how to use oxygen masks and lifejackets to the tune of Men Without Hats’ "Safety Dance." Some passengers applauded them after their routine, while a few asked for one more dance. Candice Iyog, Cebu Pacific’s vice president for marketing, rejected earlier criticism that the routine was sexist, according to the AFP. "The reaction was generally very good... Our Cebu Pacific crew is having fun doing these activities." She added that the airline will decide next week whether or not to implement the dancing program on a regular basis.